Railway Board Chairman Ashwani Lohani also said no step the national carrier takes could be completely foolproof against negligence of people and urged them to be careful while crossing tracks. 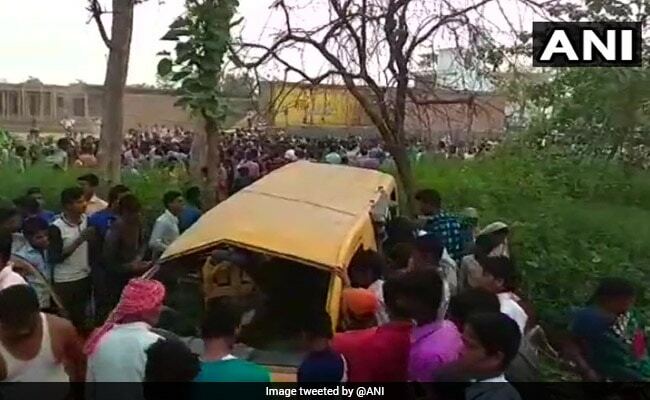 New Delhi: In the wake of the death of 13 children after a train rammed into their school van at an unmanned railway crossing in Uttar Pradesh on Thursday, the Railways said it will eliminate all level crossings by March 31, 2020. "We are trying to eliminate UMLCs (unmanned level crossing) by 2020," he said, hours after a passenger train hit the school van killing 13 children, all of them between the ages of 8-10 years on the spot. Eight others, including the driver of the van, were injured, officials said. Mr Lohani said till the UMLCs are eliminated, people have to be careful while crossing tracks. "There is no substitute to that. The Railways cannot take any step that is completely foolproof against negligence," he said. The officer also said the national transporter has been aggressively removing UMLCs - 1,565 of them were eliminated in 2017-18 and the target is of removing 1,600 in 2018-19. He said that such elimination has resulted in the decrease of accidents at such crossings over the years - in 2014-2015, 50 such accidents took place at unmanned crossings, 29 in 2015-2016, 20 in 2016-2017, 10 in 2017-2018 and one this year. He said the railways successfully eliminated such crossings at busy station by March 31 this year. Across the railway network, 5,792 such crossings still existed till that date, he said. The railways has also built over bridges and subways for people to cross the tracks - while 1,354 ROB/RUB were built in 2016-2017 and the target is 1600 in 2018-2019. "While crossing UMLCs, the primary responsibility lies with the road user, and not with the Railways. The rule while crossing such railway lines is to look both ways, stop and then proceed. In this case, according to reports, the driver did not stop. However, because the accidents happened in our territory, it remains our concern. That's why we are trying to eliminate all unmanned level crossings. In the meantime, I urge people to be careful. Also, please should not use earphones when walking near the railway tracks," Mr Lohani said. Earlier in the day, Railway Minister Piyush Goyal ordered an inquiry into the accident and announced a compensation of Rs 2 lakh for the kin of the deceased. The minister also said the Railways will provide an ex gratia amount of Rs 1 lakh for those with serious injuries and Rs 50,000 for those simple injuries. "My thoughts are with families of the deceased and I pray for the early recovery of the injured. Ministry of Railways will provide an ex gratia amount of Rs 2 lakh for kin of the deceased, Rs 1 lakh for those with serious injuries and Rs 50,000 for those with simple injuries," the railway minister said in a statement. The accident site is 90-100 km away from Gorakhpur and 30 km from Pandrauna. "Great Achievement": Railways Eliminates "All Unmanned Crossings But One"